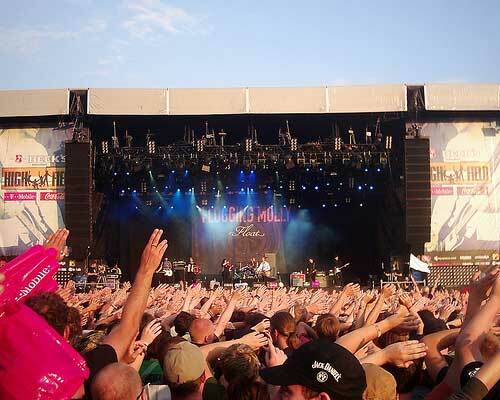 The Highfield Festival is regarded as the biggest rock festival in Germany’s east. Every year in August at the Hohenfelden Reservoir near Erfurt, national and international bands are welcomed, to serve the region three days a year with good rock music. In this years 11st edition, alongside the national stars such as Die Ärzte and The Beatsteaks even global greats like The Hives, The Killers or Bloc Party played on stage. If you go to the Highfield, then there is one thing usually pretty sure: You will attend one of the most beautifully situated festivals in Germany. Because the festival site is surrounded by a forest landscape in the immediate vicinity of a large dam, on which you can see one or the other artist with pedal boats to ride on the water. Further, the Highfield is probably one of the few festivals absolutely close to a large city, more precisely: Near the capital city of Erfurt, which is equally inviting to go shopping. But is it? City trip and festival atmosphere? Yes, it works! Operadors offered a bus shuttle service with the so-wonderful name „Highfield Express“, which run sufficient during the day and night between Erfurt and the festival to explore the well-known historic Old Town Erfurt and possibly even to celebrate with a sip of wine at the annual wine festival. In any case, it was a successful year for the biggest festival in eastern Germany – with an estimated attendance of 25.000 rock fans. Welcome back in 2009!